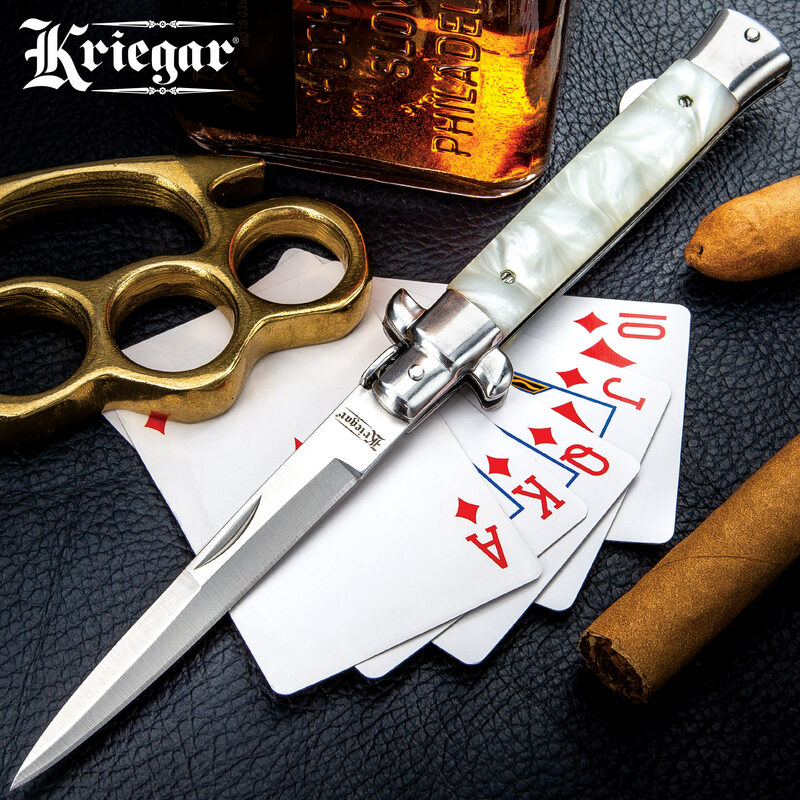 Kriegar High-Roller Stiletto Pocket Knife - Imitation Pearl | BUDK.com - Knives & Swords At The Lowest Prices! Enjoy Kriegar's classic styling and quality in this handsome Kriegar stiletto. It's the perfect gentleman's knife! 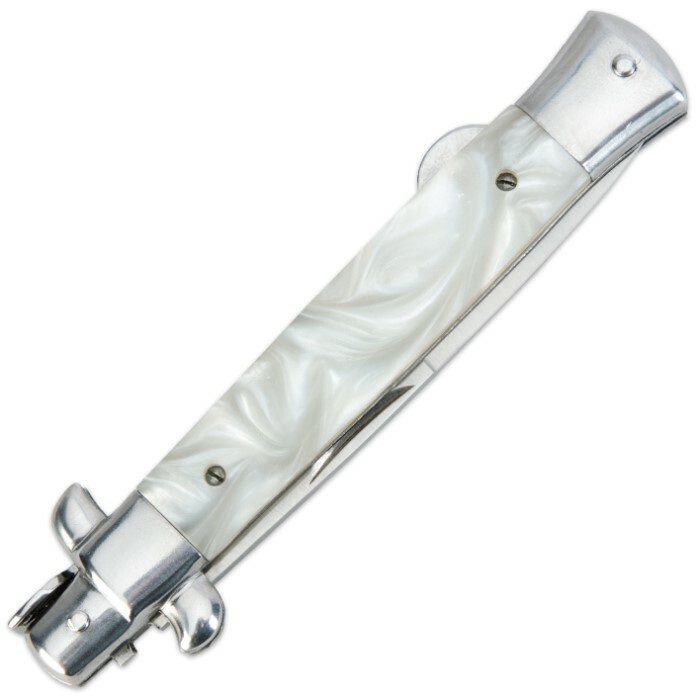 Each stiletto features a razor sharp stainless steel blade and an imitation pearl handle. Really nice, especially the Price.. These Kriegar's are very well made. Nice fit & finish, nice heft and I love lockback knives! Both Knives are incredible !! I have not seen better engraving than what is provided by BUDK............They (knives) will make beautiful gifts as planned. And of course (it is implied) that they came sturdy, sharp, and pointy !!! nice looking,worst knife edge I have ever seen.no tip, round ball for a tip.I would not recommend to buy. A Great Stilletto the previous reviewer does not know what he is talking about. A stiletto is a knife with a particular type of spine lock for the blade, it is not an automatic opening knife or switch blade. This knife although not as good as it once was quality wise, is one of the best Chinese made examples on the market. It has a traditional `Bayonet' style blade and is a good functional knife for light use. This is a nice knife. However, this is a great example of false advertising. On the Kriegar box that it comes in it says German Imitation Pearl Stiletto FOLDER. No where on the decription of this knife does it say it is a regular folding knife which leads one to believe it is a regular stiletto spring assisted switchblade. Again, still a nice knife and i will keep it because i like the look. 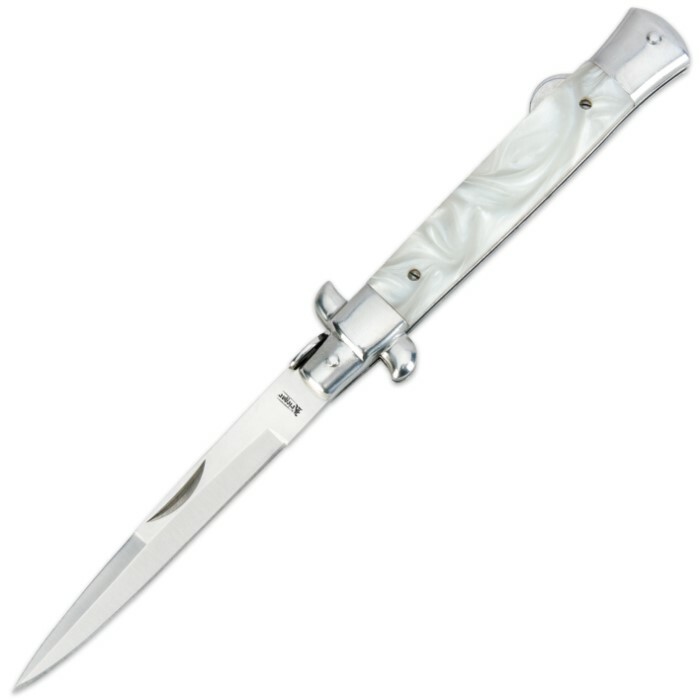 But buyers be aware, this is just a regular folding knife that looks like its a switchblade. NO SPRING ACTION. Have a nice day.